A Canadian inventor has set a new world record by gliding a few hundred meters over a lake on his self-designed hoverboard. The flight caught the attention of all the Back To The Future fans just months before the movie’s iconic October 21, 2015 date. 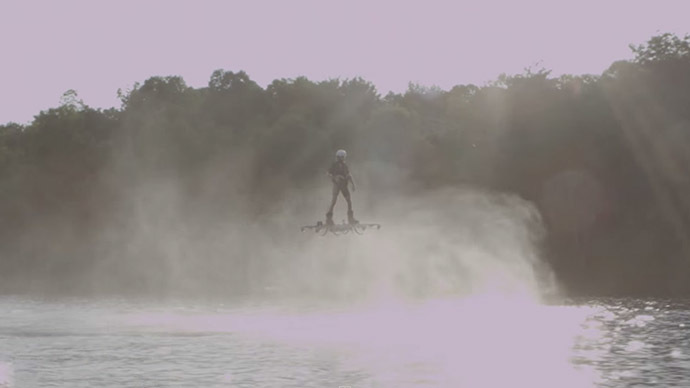 Guinness World Records confirmed that Catalin Alexandru Duru piloted his propeller-powered hoverboard 275.9 meters (905 ft 2 in), more than the length of two full sized football fields, and then smoothly landed on Lake Ouareau in the French-speaking province of Quebec, Canada. The flight set a new record for ‘Farthest’ flight by hoverboard. In order to beat the old record, Duru had to glide over 50 meters. “I wanted to showcase that a stable flight can be achieved on a hoverboard and a human could stand and control with their feet,” Duru said when describing his achievement. The footage released on YouTube shows Duru flying at a height of 5 meters. A Guinness World Records spokesperson said the organization was impressed with the invention.